In her dream Khushi Kumari Gupta was busy eating from a plate full of crispy bright orange jiebis and a high heap of steaming hot crunchy samosas. Her brows furrowed. Vaguely she registered herself dreaming. Her last meal in Gupta house before her marriage, and even in her own dream she could not eat in peace! Buaji was shouting at her from far away. “Uff bauji humein shanti se khane do na“, she grumbled and decided to sprint off with the plate to find some solitude. Within her dream world she turned, raised her leg to run, but when it fell upon the ground beneath, the surface was astonishingly strong and firm. Somehow, warm and comforting. Could the earth have such characteristics? She blinked open her eyes, a little disorientated. Was she in a dream within a dream? Arnavji was right beside her, on the bed! Buaji was still shouting outside. What in the world was happening? It was extremely hard to unravel what was happening when it was effortless to get lost in those drugging dark eyes next to her. “tum hamesha aise soti ho?“, unfazed, he questioned her casually. Her leg was draped across his torso. Not wasting time on blushing, Khushi retracted her leg with speed that would have ashamed even a national level sprinter. After she had successfully moved her leg off him, having nothing else to do except stare, at close quarters, into his eyes, she could not stop the heated reddening that made an appearance on her nose. His right eyebrow was still arched high in an amused curiosity. Light as feather he flicked her nose. “Tomorrow night is going to be.. “, he paused. “Interesting“. He noted with a satisfied air still eyeing her leg. He raised himself at an angle and touched her payal, that shone resting near her ankle. “sankadevi.. “, buaji was clearly outside the door. With surprising agility, again, Khushi sprang up and pushed Arnavji under her blanket. Not a moment passed before buaji was upon them. “h..ha buaji. You go sleep. What are you doing awake at night? Kal kitna kaam hai buaji.. Do you even remember kal suhaag raat hai“..
Hey devi maiyya what was she saying.. Khushi smacked herself on her forehead in despair. She could hear a smothered chuckle next to her. He was on her bed sharing her blanket.. Her head was reeling. “hainn?”.. Buaji’s laughter boomed in the still night. Having given up controlling the events of this night Khushi could only chew her lips and listen. “don’t worry titilya hum bhi pehle bahut darat rahe ee sab baatan soch kar, par tumhre phuphaji bhi na..”. Buaji was trying to sway gently, highly impossible given her heavy mass. Her hand fondled her long plait. “ha..ha buaji.. Aap jake so jayiye ab.. Please..“, Khushi hastened to somehow get buaji from talking further. She was mortified enough, already. “Parmeswari it is your last night in our house. Hum sochat hainn eeha apni Payaliya aur sankadevi ke sath hi so jai rahe. Shift a little“. Khushi went sliding towards the warm presence in her blanket, buaji had tried to sit on the edge, which basically meant she took up practically half of the bed. The bed gave a loud creak and it was buaji’s turn to show her agility. “Aisan toh ee bistar humare jaisan majboot hainn, but it will be better not to take a risk“. Plastering a hearty kiss on the nervous girl’s forehead she blessed her. “nand kisore tomorrow is your wedding..“. Buaji tucked her niece in for the night. Finally, she ambled out much to someone’s relief. Khushi was alone with Arnavji. In the dark, having Arnvaji close, in her room, on her bed, felt..exciting.. That know-it-all voice in her head whispered to khushi. When ASR pushed off the blanket he was a little exasperated with himself. He frowned. He had accompanied Akash and Payal to Gupta house. 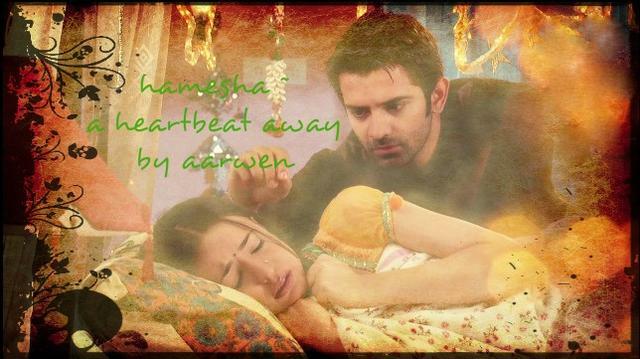 The couple had been happy to be given a few minutes alone when ASR slipped into Khushi’s room. And here he was, but what was Arnav Singh Raizada doing hiding from buaji? Covered by a blanket. He made a movement to object to having been pushed into a rajai. One look at the girl next to him shut off all thoughts. He was in khushi’s room, on her bed. Having her close in such an intimate surrounding, was a new feeling. One he longed to get used to. She would be with him from tomorrow. The thought made him extremely happy. A sense of fierce pride washed over him. She was his. With a gossamer touch he brushed the lock of hair that fell over her eye. She blinked, but did not move away, trusting and comfortable. He shifted closer, his hand on her waist. Damn the stupid blanket! He couldn’t even see his hand as it held her..
She flowed towards him. She was soft. And exquisite. Everything about her confounded and delighted him. He longed to know every single thought that flit through her gorgeous head. She answered without hesitation, her voice, the slightest of breathless, “kal se hum sath honge“. “hamesha“, he confirmed and finally succumbing to the inevitable, kissed her. Long and deep. She sighed and wriggled closer into his arms. A fresh sense of longing, a compelling desire stirred within. There was newness and a pristine sense of promise. His hands moved freely, she reveled in the touch, arching towards him. Slowly loosing herself in the wonder of his touch, she moved her hands to touch too. Unfamiliar firm strong muscles that her fingers were coming to know. “Arnavji“.. came her querulous sigh. He pulled away, even though she seemed unwilling to let go. “khushi.. main“, came his a deep throated whisper. There were so many things he wanted to tell her, but words would not be enough to capture the emotion that ran in his veins. Her breath was haywire, but an profound certainty was visible on her face. “hum samajhte hai“, and at that moment there was no truer words. She knew his heart and all the love it held for her. A hushed knock on the window startled them. Payal must be outside wanting to be let in. He was on his way out, when he turned. Khushi sat in the middle of the colorful riot of the blanket, her hair disarray, a sad smile on her face, watching him go. He couldn’t possibly leave her looking this sad..
A devilish smirk played on his still wet lips. “Khushi sleep well. And don’t forget kal humari shaag raat hai“. Her eyes went wide and mouth opened equally wide. “bye“. Satisfied that sadness was replaced by all sorts of other thoughts, he made his smooth exit. Khushi still had her ‘haw‘ face on, when Payal slipped in through the door. Their last night as young girls in Gupta house. All the myriad colors woven in their dreams were read to splash into their lives the very next day. They were getting married. They held hand tight as they lay on their backs staring at the ceiling, unseeing. Their thoughts busy with what was to come. “ow jeeji“, Khushi had been smacked on the head with a sorry looking pillow. Rubbing her eyes, with the back of her mehendi covered hand, she sat up and gasped flabbergast. Had her room been hit by a hurricane at night? Everything was scattered everywhere and from what she could gather buaji was claiming this was meant to be packing. “Will you wake up please Khushi? Humein packing khatam karna hai. Then mandir jana hai and be at shantivan by noon“. Payal had picked up a stack of plain chiffon sarees and was eyeing them critically, deciding if she wanted a rainbow of similar sarees in her new wardrobe. So, she missed the mischievous smile that lit her sister’s face. Khushi had grabbed a fuller newer pillow and aimed it with precision at Payal. Panting and giggling, within no time both girls had indulged in a pillow fight, much to buaji’s dismay. Garima was taking care of the preparations outside while buaji had appointed herself to get the girls ready on time. If her neighbors so much as stepped into this room they would have realised how incompetent Madhumatiji was in getting her nieces ready. Still, she did not have the heart to break their fun. Breathless, her sides aching with the giggling, Khushi suddenly recollected how she had taught even lavayaji the joy of a good pillow fight. Of course, it would have been way more fun if, like in the movies, the pillows burst open and feathers floated all over. That never happened in Khushi’s room. buaji’s stupid sturdy pillows! Khushi glared at the them. After buaji had shouted again and got the girls moving, Khushi rushed to find the trinket box that had the most precious of her belongings. She peeped into it. A leaf he had pulled out from her hair, a sequin from the saree he had gifted her, his ma’s letter; all lay safe within. She quickly placed it next to her devi maiyya. Even if she forgot all her other things, these two were the ones she needed with her. He was looking at the roses surrounded by verdant bushes. It would have been considered to be early in the morning by most, but already there a great deal of excitement and noise. He didn’t care. He was looking at the roses. A lady with a warm smile and weary eyes made her way across the damp lawn. Her silk saree was half in gold and half in saphire blue. She held the pleats a little above her ankle, afraid of getting the edges spoiled. Her hand had gold bangles almost all the way up to her elbows. He called out to her in excitement. “dekho the plant you were watering everyday has finally sprouted a bud. A red rose ma“. With a serene smile she viewed the rose which was taking its first few breaths. A few dew drops glistened on its velvety outer petals. “ab Chalo Chote. It is your wedding today“. Her hand was extended out towards him, beckoning. He wanted to catch it, but couldn’t seem to get to it. She, however, smiled reassuringly, stepped forward and caught his hand in her hers. “I’m here chote. With you“. ASR flung off the covers. Wide awake with a clear head, he settled against the dark ebony rosewood headboard of his low rise bed. He reached for his blackberry and with a strange eagerness dialed her number ..
“Haaloo“, came her trilling voice from across. “Hi“, he sounded husky to his own ears. A mixture of slumber and love caused his voice to take this heady tone. “Arnav“, he patiently corrected. His grin became more pronounced imagining her state of discomfiture at the other end. Was this feeling called missing someone? A solemn thought entered his mind. He missed ma and it always made him choke with a sense of unbearable sorrow that he had endured for ages. It had become part of him. Could missing someone actually make you feel joy as well? He had no idea how Khushi managed to make his insides light and hopeful. Even ma had reached him in his dream today, not melted away unreachable like always. “uff laad governor 5 baar hum yehi sawaal puch chuke hai.. I will come and explain abhi hum rakhte hai”. He was about to disconnect when her querulous whisper reached him. “Arnavji I miss you“. And she cut the call. Now, he was definitely smiling, widely. He decided, that though missing her made him happy, he would still prefer her to be right next to him. And she would be, starting today. His heart seemed to indulge a funny sort of leap. He put on his most serious look and tried to ignore the silly uncontrollable nonsense taking place in his heart. It was time for his regular jog, and he would give Aman a call and talk about the consignment of pillows.. Huh? .. Did he just say pillows in his head? Dammit.. Why was she thinking of pillow fights? No, nothing was regular today. The austere Shantivan halls had been decked with flowers. His solitary jog was blocked by workers setting up points where fire crackers would take place in the night. Even OP had transformed from plain colored kurtas into a bright shocking red kurta. Regular? He might as well forget that words exists.. 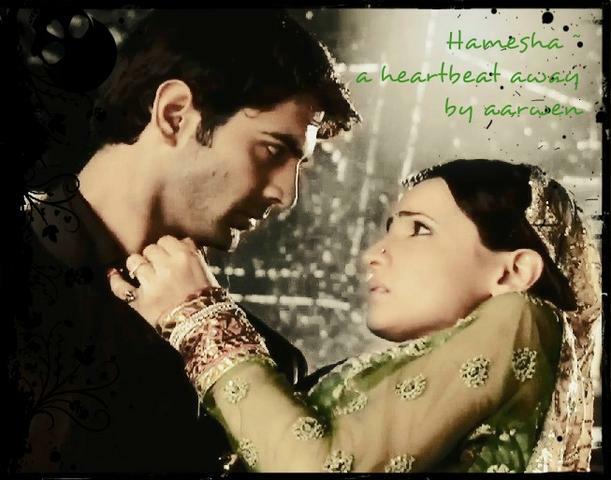 Though his face had no hint of mirth, his heart continued its own sprint and jiggle.. Khushi.. It seemed to utter with each beat..
Anjali lay in a half drowsy state, her head resting on her grandmother’s lap. She was relieved that sleep had seemed to dull the hollow sensation inside her. Nani’s hand continued patting her in that soothing motion. She debated on waking up fully, or resisting the demands of reality for a few more welcome minutes. Nani sat humming a gentle tune. A half forgotten lullabye that Anjali’s ma would also sing. Most probably, ma had learnt it from her mother, the very lady humming the song now. Not too long after, the door burst open and in walked Manorama Raizada. It was hardly dawn and mamiji was still in her printed flowery satin nightgown. She had meant to tip toe in it seemed, but seeing Anjali’s eye open she plopped down comfortably at the edge of the bed. “Nani do you remember how ma would put oil on my hair and tie it into two plaits when I was sick?“, Anjali turned to look at her grandmother who nodded gently at her. “Such a normal thing to do..“, her voice trailed off wistful. “no noj Anjali bitiya.. Sirf tel naahi.. Aaj ishaampooing bhi karike pari.. Ebhening ma too tooj shaadi hai eeha.. Makupiya toh thik tarah se karike pari“. Anjali sat up to humour her mami, letting her apply the oil on her hair, while Nani went to take a look at the commotion outside. Om Prakashji’s shrill superior shouting, interspersed with bouts of equally shrill laughter, was evident even through the heavy doors . The pressure from mami’s finger’s actually felt heavenly on Anjali’s head. Mami chattered away happily on which fire crackers she thought were her favourite, Anjali let herself feel nothing except the heat of the oil against her scalp. The door opened and OP walked in with a tray. ASR followed close. “di breakfast“, his voice was tentative. “Om Parkaas eet eej time phar my gilas aaph orange juice pileej.. No issugar.. Only ice“, Manorma rushed after him shouting her instructions in the most imperious of tones. “chote ye toh..“, Anjali looked at the tray of food. “ha di. Mathura aaloo puri. I asked nani to make it for us. Here have some“, he placed a heapful of food onto a plate for his di. She accepted the plate and took a bite savouring the taste of the familiar security of nani’s cooking. She saw ASR eating a small helping of the food too. His measured small bites, plate was left tidy as he wiped every crumb off it in is usual perfection. “Di aaj mere dream mein ma came. She was fine di. Aur aap.. aap mere liye sab kuch ho. We have each other. Sab thik hai di.” ASR had put his plate aside. Earnestness in his demeanor was evident. He meant every word. “anything di.. Tell me“, came his wholehearted reply. With a straight face she responded.”You know there is one thing that will make me happy my dear chote bhaiya. Wear the sherwani I brought you.. Please“. He shrugged, thought his eyes crinkled at the ends, giving away his delighted mood. “Fine“. “excellent. do you know I matched it to Khushi bhabhi’s lehenga, but it has something to your taste as well. Black and red“. “Now don’t go all poetic and say I will look like the smouldering coal or something like that di. You chose it. I’ll wear it“, his lips were pursued, but stretched at the end, controlling a smile. Anjali clapped her hands in delight. Her papad ka tukda was getting married. She had spent hours dreaming of this day. Boring Shyamji with the details, the never ending plans. Shyamji.. She breathed in deeply. Arnav Singh Raizada was wearing a dapper grey cotton shirt. His waistcoat was of a darker grey hand woven khadi cloth. The clean cut could leave no one in doubt that the best fashion house had its hand in this master piece. With this casual elegance, a day old stubble on his face, hair glistening with the remains of his morning shower, he concentrated on his plants. There were sunflowers in bloom in the pots. All they needed was a sprinkle of water. Meticulously he watered the plants. He could hear mamaji shouting instructions at some worker outside. He was torn in amusement at how excited everyone was, but his thoughts lingered over di. He was worried for her. The anguish had not left her eyes. It bothered him a lot. He moved to the rows of roses. Yes his garden finally had roses in bloom.. The fragrance wafted towards him soothing his spirits. Now, it seemed mami was in a fit about something. He wondered if he should go look. Nah, he would leave it to others to deal with her. When his phone range he guessed it would be Aman. Luckily someone managed to stay sane in all this. It would do ASR good to discuss some actual work. However, when Aman actually started speaking, ASR had to groan. He disconnected the call. Apparently, Aman preferred selecting which sweets would be served tonight, than looking over stock statements today. Okay, so even Aman was not untouched by this wedding madness, ASR thought wryly. A moment later some more madness made its appearance. Akash and NK walked up arguing in loud tones. “bhai tell NK bhai to give me back my shoes“, Akash complained. He was barefoot and clearly sulking. NK was gloating, a pair of sneakers dangling in his hand. “Nannav main aise nai kar sakta. You see I know everything.. joote churana ek kasam hai“. NK stretched himself on the garden chair. “Rasam“, ASR corrected him smoothly. His eyes caught Akash. The unfortunate groom tried to reason with his cousin. “The rasam is for the girl’s side. They have to try to steal our shoes, not our own brother. NK bhai..“, he was exasperated. “na na Akash. Itna fun rasam kasam whatever main unke liye chor dun? Tum ghayal ho.. crazy.. Tum mujhe paise do nahi toh main tumhare shoes ko..“. He looked around deciding what the most effective threat would be. He spotted the glass of juice that OP had left for ASR. “nai toh main tumahre shoes mein ye juice daal dunga“. Nk declared as he picked the glass of orange juice that OP had left for ASR. ASR wasn’t paying attention anymore, he was laughing. His cousins stared in amazement at the sight, but ASR was staring at a girl blowing her nose admitting to have poured mango jooce into his shoes. A normal day? hell no! Arnav Singh Raizada was getting married to Khushi Kumari Gupta. ofcourse it couldn’t be a normal day..it’s Arnav-Khushi’s wedding day.. laad governer wedding with sanka devi..marriage of azeeb couple..I’m so excited to read it..
oh next chapter is one of my favourites. yes their wedding day how can it not be ajeeb. Am excited that you are going to read it. Hope you like it!